Why on earth would a blogger need to design worksheets and checklists, you ask? Well, let me tell you, they’re mighty useful! Worksheets and checklists are some of the easiest things you can create in a few hours tops and use them in your blog posts as content upgrades. Instead of creating something from scratch, would you rather have something pre-made to work with? You can download the Canva templates for workbooks and checklists I made for you. Sign up for my newsletter by clicking here, or by filling out the form below, and I’ll send you these templates. Step 1: Start with Letter Size. Content upgrades are amazeballs! They are basically “bonus” or “extra” content that you use within your blog posts. You offer these bonus content to your readers in exchange for their email address. This is yet another way to grow that email list that’s so important for all bloggers. If you’re not sure what I’m talking about, please read my post on why and how to grow your email list. I use content upgrades often in this blog. There is this blog post about why bloggers need media kits, where I used a media kit template made with Canva as a content upgrade. 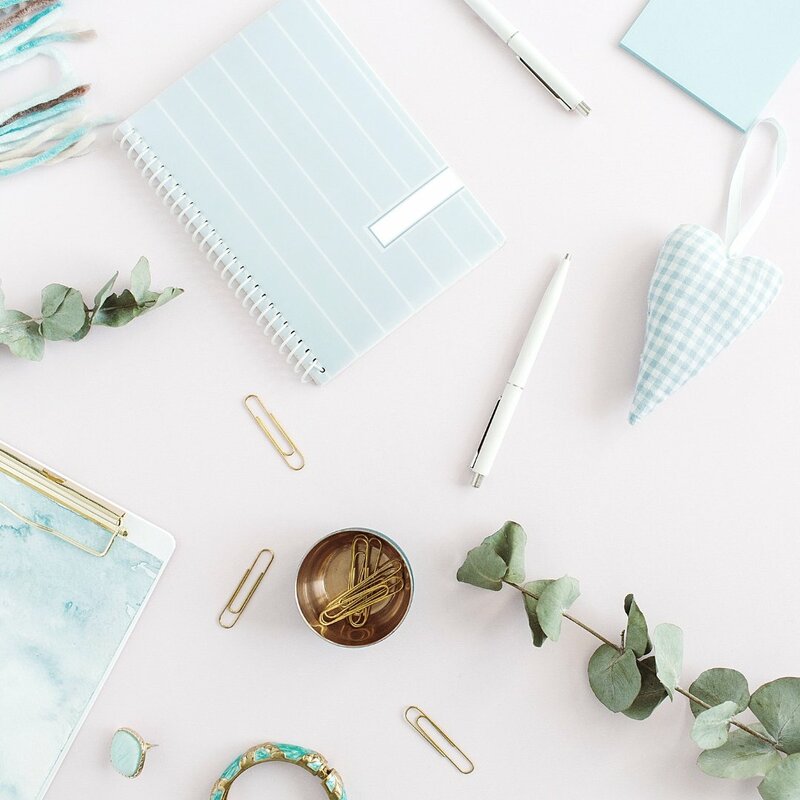 In another blog post about how to prepare for starting a blog, I used a worksheet as a content upgrade where all wannabe bloggers can work through the logistics of starting a blog. Both of these blog posts are two of my most shared posts in social media and Pinterest, and most of my email subscribers joined the list through one of these content upgrades. As you can see, content upgrades are to blogs is what air and water are to plants. But the bigger question is, what should a blogger use as content upgrades? Well, it really depends on your niche and what the topic at hand is. Most of my readers on TSB are new bloggers. They need directions, guidance on how to start a blog. That’s part of the reason why the blog pre-launch worksheet content upgrade is so popular with so many of my readers. It’s the same with the media kit template. Most of the new bloggers who come to my blog are not bonafide designers. They need a media kit, but they don’t have the design background to create their own. So they like the idea of taking a pre-made template and then updating the copy and images to suit their needs and branding. The best kind of content upgrade is one that your readers need right NOW! Worksheets and checklists are great because you can use them for a lot of different things. Let’s say that you have a blog post about morning routines that make someone productive and feeling good and healthy throughout the day. You write a detailed blog post about each step, taking the time to break down the benefits of each of these bulleted items. That’s great! You want to give your readers as much information as possible. However, you also want your readers to follow through and actually do the things you’ve outlined. Now, most of your readers won’t remember some 20 something steps by heart. They’ll also not go through your 3000-word blog post every morning. So, to make things easier for them, how about you create a checklist that they can just pull up on their tablet or laptop or phone, or something they can just print out and keep it nearby, and they can check off each item instead of having to sift through your lengthy post to find the next steps? And that checklist right there can be your content upgrade! Designing content upgrades doesn’t have to be some mighty undertaking. I like worksheets and checklists because they’re so easy to make. And in today’s post, I’ll walk you through designing these worksheets and checklists with Canva. If you’re a blogger, I’m sure you’ve heard of Canva already. And if not, check it out pronto! Canva is my favorite graphic design software to use for things like blog graphics and workbooks/worksheets, checklists, etc. As much as I love InDesign and Photoshop and Illustrator, sometimes I really do not need the complexities that come with these industry level, professional grade software. Something a bit simpler such as Canva works just fine in these situations, and it helps you create beautiful graphics easily with drag and drop features, without compromising quality. 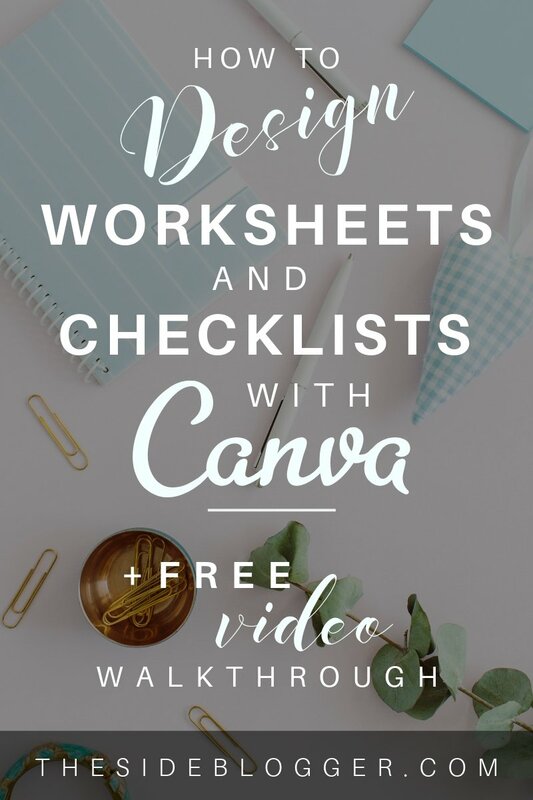 In this blog post, I’ll walk you through how to create worksheets and checklists easily with Canva. You start by going to www.canva.com. There are two methods that you can use. You can either create a unique design on a blank template, or you can use a pre-made template available in Canva. If you’d like to use some of the pre-made worksheets templates, start here. The thing with pre-made Canva templates is that they are great if your needs perfectly align with the templates they have. Which, most of the times, is not the case. So, you may find yourself needing to create a template from scratch. In the following steps, I’ll show you some ways you can easily create your own workbooks or worksheets. Make note that I like to create all my designs on my laptop. I do not use the mobile app. So, the following instructions are all optimized for the desktop/browser version of Canva. I’m using Chrome on a Windows machine to create these designs. The options aren’t all that different, if not exactly the same, on a Mac. In the top search box, start typing the word “letter”, and the Letter option will show up as shown in the image below. Click on it, and that will open a new window with a blank letter-size design. Alternatively, you can use the “Custom dimensions” option at the top right corner to create a document that is 8.5 inches wide and 11 inches long. In the blank design, click on “Text” from the toolbox on the left. The text panel will open. Choose “Add a heading” from this panel by clicking on it. This will add the header. Chances are, you’ll want to reposition this, tweak the font, and resize it. Repositioning is simple. Just click on the text box, hold it, then move it around. To change the font and font-size, make sure the textbox is selected. This will open the text options on the top of the design. You’ll see a bunch of options here to change the font, font size, color, alignment, letter, and line spacing, etc. Use them to change the header title as you see fit and until you’re satisfied. Do not forget to actually change the title text to match whatever your unique title is. Next thing you want to add is a question or task. This acts as a prompt for your readers to take certain action. Usually, in a worksheet, you want people to think certain things through and write down their reactions/impressions in a text box. To add a question or action prompt, once again, you should be in the Text panel. Click on “Add a little bit of text body”, and then reposition, resize, and change anything else you may just like you did for the title in step 2. Next step is to add a text box or work area. Canva is great in that it already has built-in grids, shapes, and frames. Based on what your need is or what kind of design you want, you can choose from these built-in elements, and the rest is as simple as dragging and dropping into the design. For this exercise, I’ll be choosing a built-in square shape with a border around it for my text boxes. Choose “Elements” from the toolbox on the left. In the panel that opens up, locate “Shapes” and then click on “All” to expand the Shapes option. This will give you more shapes to choose from. Refer to the image below if you need more clarification. Once you’ve chosen the bordered shape, you can drag it anywhere you want, by clicking on it with your mouse, and pressing the left mouse while moving it. Just like you did with the texts. You can resize this box by dragging on any of the handles along the sides or the corners. You can also change the order and fill colors from the options at the top of the design area. Position the texts and text boxes so they align with each other. Choose Elements, and then scroll on the panel that opens up to go to Shapes. Click on “All” to show all available shapes. Choose the shape you want. Then play with it until it’s where you want it to be. Feel free to resize the shape and change the border and fill colors. Reposition and continue to tweak until the text and box are aligned or however you’d like them to look. Now you can imitate the steps 3 and 4 to create more questions, prompts and text boxes. Or, to make things easier, if all your questions/prompts and text boxes are around the same dimension, you can simply copy and paste the ones you’ve already created in steps 3 and 4. To do that, start with selecting the element you wish to copy. You can do so by clicking on the element. When an element is selected, an option to copy the element will pop up on top of the design area, as shown in the image below. To select multiple elements, click on the first element you want to copy, and then holding on the “Shift” key in your keyboard, click on the next element. To copy the element, click the “Copy” button on top of the design area, or click Ctrl+C (on Windows) or Cms+C (on Mac). If you use the “Copy” option from the design area, it automatically copies and pastes the selected elements on the same design. If you use the keyboard shortcut to copy the elements, then you’ll have to use another keyboard shortcut to paste them. Use Ctrl+V (on Windows) or Cmd+V (on Mac) to paste the elements. It’s useful to know the keyboard shortcuts because this allows you to copy elements in one design, and then paste the same elements in a whole different design opened in a different browser tab. If you’re working on multiple designs that use some of the same or similar elements, this feature comes in handy and saves time. When you have element(s) selected, the options on top of the design area allows you to copy (and paste) the selected elements, group elements together, position a certain way, etc. And finally, here’s what a basic worksheet may look like. Now, you may have more steps that you need to add. If you need to add more pages, you can do so by clicking on “+ Add a new page” underneath your design, as shown below. Click on “+ Add a new page” to add more pages. Repeat as many times as necessary. Alternatively, if all your pages will be using a similar structure, you can just copy the page you just created. To do so, click on the double rectangular icon on top of the current page that you wish to copy. This will add an exact replica of the page to your design. Checklists are just as easy to design and just as handy as worksheets. Unfortunately, there are no built-in, pre-made templates for checklists that I know of, so you’ll just have to design the whole thing from scratch. However, you saw how easy it was to create a worksheet from scratch, right? Trust me, checklists are just more of the same. In fact, to create a checklist, steps 1 – 3 are exactly the same where you select a Letter size empty design, add a checklist title, and then add a question/task/prompt. Now, instead of a text box, you’ll be adding a checkbox. To do this, once again, I’ll choose a square shape from the shapes panel. But this time, I will choose a rectangular shape without the border. In fact, this time I’ve decided to choose a rounded-corner shape. Once you’ve chosen the shape of your choice, click on it to place it in your design. Then drag a corner to make it smaller, the size of a typical checkbox. Then click on the square, and move it while holding down on the left mouse key, to place it next to your text question/prompt/action. Reposition text and checkbox until they look good. Repeat step 5 from the previous section to add more checkboxes. You can also mix checkboxes and text boxes to create a workbook, depending on your unique needs. Some actions may require users to simply tick off a task, and some others may need some thought put into it and writing down more elaborate responses. Based on the steps I’ve described above for creating both text boxes and checkboxes, you can easily create a hybrid design consisting of both! Before you download your design, remember to rename it. On top of the design window, next to the button that says “Share”, you’ll see the file name in a text-box. Simply click on it with your mouse and that will allow you to edit the file name. Delete the default name, and type your unique design name. After you’re finished typing, click on somewhere else in the design window, and the file will be updated with the new name automatically. Now that you’ve designed your worksheet, it’s time to download your document. On the design window in Canva, on the top right, there is a button with a download icon, as shown in the image. Click on the download icon, and from the options, choose PDF Print from “File type” and choose the page(s) you wish to download. Then click on “Download”. When you click on the download icon, some options pop up. Choose PDF Print for the file type (“print” is better quality than “standard”) and then choose which page(s) your wish to download. If you want to download all pages, then choose that option. Then click on the “Download” button and voila! Often times, you may want to make your worksheets and checklists more interactive by creating fillable areas. I like to use a program called PDFescape for creating these fillable areas. You start by going to www.pdfescape.com and then click on Free Online, as shown in the image below. There are some options on top-left of the page. Choose the last one that says “Form Field”. This will open up a pop-up with some more options. Choose “Checkbox” for Type and then click on “Select”. This will allow you to select (more like choose the entire area) a checkbox in your pdf document that will become interactive. Remember, the program cannot automatically detect which parts need to become interactive. So you must select with your mouse the part of the document that you wish to turn into a clickable checkbox. By default, the checklist has a checkmark. If you want the interactive checkbox to be empty, click on the checkmark once and it will go away. Choose “Form Field” to open up the dialogue box where you can choose the options you want to for your fillable areas. Select “Checkbox” or “Text” for fillable checkboxes and text boxes, respectively, then click on “Select”. Repeat the process for the rest of the checkboxes. Pro-tip: PDFescape remembers your actions, and once you’ve created a checkbox, you’ll be able to create more with just a click, as opposed to repeating the whole routine. This is useful for checkboxes or textboxes of the same size. If your textbox sizes are different, you’ll need to manually change the sizes. To create a fillable text box, once again, click on Form Field, and then choose “Text” for the type, and then click on select. This will allow you to choose a text area with your mouse. Repeat for all the textboxes. Once you’ve created all the fillable areas, click on the green download icon from the left menu panel as shown in the image below. This will download an interactive, fillable PDF to your computer. Click on the green download icon from the left panel to download the final, fillable PDV document. And that’s it! You have now created an interactive, PDF worksheet that you can use as a content upgrade with your blog post(s). And now, here’s something new! I’ve decided to create a couple of videos to walk you through all the steps that I’ve just described above. Hopefully, these will of help to you! And now, if you’d rather have something pre-made to work with, you can download the Canva templates for workbooks and checklists I made for you. Sign up for my newsletter by clicking here, or by filling out the form below, and I’ll send you these templates. As always, leave a comment and let me know if these are helpful to you. If you have questions, feel free to share them also! Yeah, thanks so much for this post! I’m in about my 5th month of blogging and still trying to figure out opt-in’s and content upgrades. I’m so excited to learn about PDFescape! I’m so surprised I’ve never heard of anyone else even mentioning that tool before. I’m also excited to have found your blog and to learn more from you– as I’m working to turn my blog into my full-time hustle. I didn’t know PDFescape, and I was looking for something like that for a lifetime! Thank you so much for that life changing discovery! Thanks, Marie! Glad this was helpful. PDFescape has a lot of great features that you can explore. Good luck!